We don’t use many things that operate on non-rechargeable batteries anymore, but there are some things that require them. When you do actually need them, it’s a nightmare finding the proper batteries, let alone ones that aren’t already dead. For those that like to be organized, you normally know where you can at least find their general whereabouts when you need them, but it’s sometimes difficult to remember to check how many batteries you are away from running out. 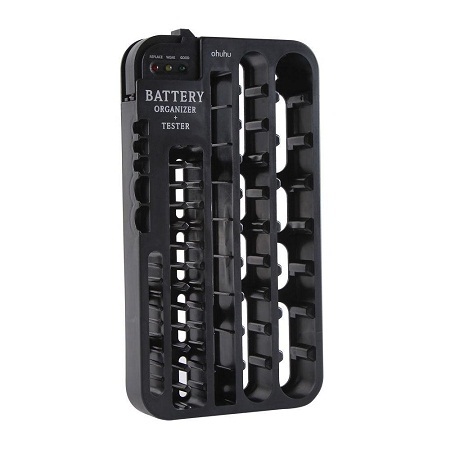 This Ohuhu Battery Organizer will not only help you know where you’re at with needing to go buy more batteries, but it also has a removable battery tester. This has slots for 8 D, 10 C, 9 9V, 26 AA, 10 AAA, 6 circular, and 3 3V button battery sizes. If you’re not quick on the math, that’s 72 battery slots of space, and it was made to be put into your drawer, though if you like having things out and in the open, you can mount it on the wall. This measures 12.7 x 7.5 x 2”, which is certainly going to take up less space overall than just leaving them out and scattered in the “thing” drawer where it’s really difficult to find anything. The battery tester is quite easy to use, and three lights will let you know what the power levels of the battery in question is. This will only cost you $10.99, and would be rather helpful for those of you who use more batteries than you’d like to talk about.